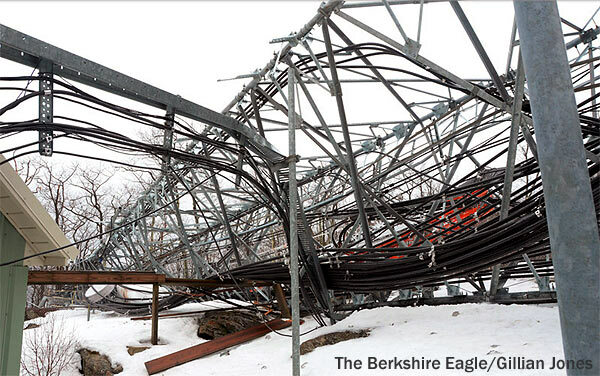 In this week’s issue… Towers collapse in western Mass. – Shannon gets a sidekick, loses a syndicator – Format surprise in Ottawa – RI Hall of Famers named – Plus: Baseball on the Radio – the Minor Leagues – And read to the end for details on our big NAB Show Radio Gathering next Tuesday night! *It’s been a brutal winter for most of us across NERW-land, with snowstorm following on snowstorm well into what really should be spring by now. Until this past weekend, though, all those winter storms had caused not much more than inconvenience to broadcasters. But early Sunday morning, the weather claimed two towers in western MASSACHUSETTS, silencing two FM signals and wreaking havoc with a third FM signal that was just days away from signing on for the first time. It happened on Florida Mountain, up by the famous hairpin curve where Route 2 (the Mohawk Trail) drops down from the Berkshire hills into North Adams. 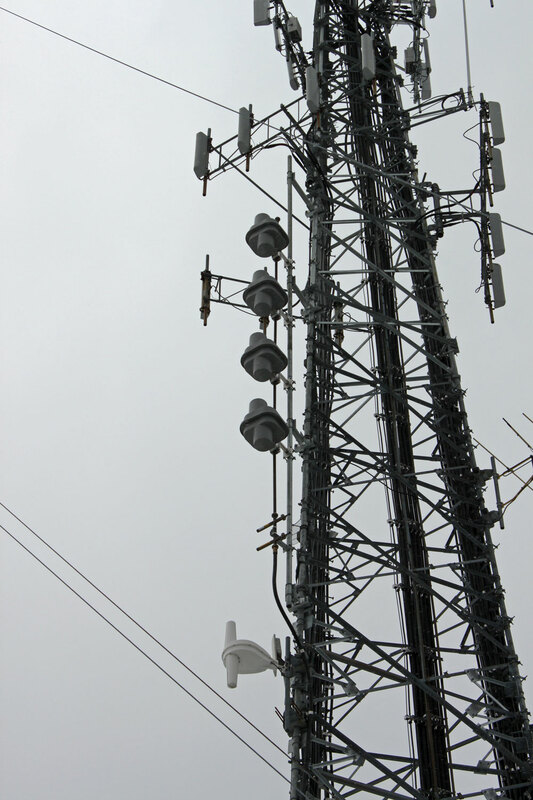 At about 2:30 in the morning, some combination of ice, rain, wind and heavy loading sent the 150-foot self-supporting tower holding cellular and public safety antennas and the antennas of translator W266AW (101.1 North Adams) and the new WNNI (98.9 Adams) toppling, and that tower’s collapse snagged the guy wires of the neighboring guyed tower of WUPE-FM (100.1 North Adams), bringing that tower down as well. Gamma Broadcasting’s WUPE-FM (formerly WMNB-FM) was by far the oldest FM up here, having signed on back in 1964. In 2006, public station WFCR (88.5 Amherst) put W266AW on the air from the self-supporting tower, and in the last few weeks engineers were busy building out WNNI, the latest link in the news-and-information chain based at WFCR’s sister station WNNZ (640 Westfield). Dubé says WFCR will try to restore translator service quickly from a temporary facility and then figure out how to get WNNI rebuilt and on the air. The construction permit for the 2.6 kW/406′ class A signal runs through August, and in circumstances like this one the FCC is usually willing to “toll,” or extend, the construction permit to give broadcasters a chance to recover from disaster. We’ll be following this story closely as investigators figure out what brought these towers down, and how to replace them. *Are you coming to Las Vegas for the NAB Show? We’ll be there for our 14th year running – and we want you to join us! In partnership with our sister site, RadioInsight Community, and the more than 4000 members at the thriving “I Take Pictures of Transmitter Sites” Facebook group, we’re bringing our radio (and TV) friends together on Tuesday night, April 8, for an evening out at the Bond Lounge in the Cosmopolitan Hotel and Casino. Even if you have other events to attend that night (and on any given night at NAB, you probably do), we hope you’ll at least stop by and say hello. All the details are right here, or just catch up with me on the show floor for an invitation. See you there! *Still don’t believe that FM translators have become very big business indeed? This week’s column brings news of more than a dozen new translator signals poised to hit the airwaves all over the region – as well as two full-power stations preparing to move their existing formats to translators to make other uses of their main signals. The first of those is in NEW YORK‘s Westchester County, where Cumulus has quietly struck a deal to take over translator W232AL (94.3 Pomona). Until now, that little translator across the Tappan Zee in Rockland County was best known – if it was known at all – as the middle link in the chain that once brought “Jukebox Radio” from its nominal primary home up in the Catskills down to translator W276AQ (103.1 Fort Lee, N.J.) overlooking upper Manhattan. “Jukebox,” of course, ended up being silenced after the FCC started to dig deeply into the relationship between translator owner Gerry Turro and the ownership of primary station WJUX (99.7 Monticello), and the entire network ended up in the hands of a religious group, Bridgelight, which has been running the stations noncommercially. Nobody’s saying what happens after that, but it’s not hard to speculate: with a new Westchester-based FM outlet that will put a usable signal over most of the central part of the county, will Cumulus then feel more free to move the existing AC format from WFAS-FM (103.9 Bronxville) to 1230 and 94.3, thus allowing the 103.9 signal to finally complete its long-planned move inside New York City limits, where a transmitting facility already exists and has been tested atop the Montefiore Hospital tower in the Bronx? 2014 update: At least for now, the translator remains in Rockland County, and WFAS-FM still hasn’t moved to the Bronx. *East of Binghamton on Route 17, there’s a frequency change coming to Shamrock’s WBZX (107.1 Hancock). The relay of “Rock 107″ (WEZX 106.9 Scranton) is applying to move down the dial to 104.5 from its existing transmitter site on Bass Mountain, where it would increase power from 2.1 kW to 6 kW – and where the frequency change would make its off-air pickup of WEZX much cleaner, too. As for Lindsley, he’s headed down the Thruway to handle the 1-4 PM shift and Yankees pre-game coverage on Townsquare’s WTMM (104.5 Mechanicville) in the Albany market, where he starts work today. On TV, Sinclair is moving its 10 PM newscast in Buffalo. The WGRZ (Channel 2)-produced newscast has been airing on MyNetworkTV affiliate WNYO (Channel 49) since 2006, but next Monday it will move to sister Fox affiliate WUTV (Channel 29) and expand to seven days a week. The move will mark the first time that WUTV has had a daily newscast, ending its long distinction as by far the largest Fox affiliate without news at 10. WUTV will also rebroadcast the 6 AM hour of WGRZ’s “News 2 Daybreak” from 7-8 AM on weekdays. *The public radio war in eastern MASSACHUSETTS is now being waged on a new front, thanks to NPR’s surprise Friday morning announcement that it’s pulling the plug on its DC-based “Talk of the Nation” after 21 years on the air. NPR officials said the move came in response to member stations’ demands for more magazine-style midday offerings like “Here and Now,” the noontime offering from Boston’s WBUR-FM (90.9) – but we hear that even many staffers at WBUR itself were surprised by the news that “Here and Now” is shifting its distribution to NPR in July after several years of syndication by PRI, the rival programming service now based across town at WGBH-FM (89.7). NPR will assist in staffing a revamped “Here and Now,” which will add a new co-host (Jeremy Hobson from “Marketplace Morning Report”) alongside Boston-based Robin Young and Meghna Chakrabarti. In Philadelphia, it appears a format change at Radio One’s WRNB (100.3 Media) is no April Fool’s joke: at 5 this afternoon, the station is expected to announce a flip from straight-ahead R&B to “Old School 100.3,” following on the heels of similar Radio One outlets in Dallas, Charlotte and St. Louis. It was a bad week for legends on both sides of the border. Canada lost one of its heritage oldies stations for a second time, while Boston lost one of its favorite talk radio voices. We’ll get to the legacy of Larry Glick a bit later in this week’s column, but first we’ll do what CTVglobemedia couldn’t be bothered to do and give Toronto’s CHUM (1050) a proper burial after 50 years of rock and roll. The last time CHUM changed format, back in May 2001, it was a big deal indeed. Back then, the Waters family still owned the station, as it had since the fifties, and the big flip to “Team” sports radio came with an all-day party at 1331 Yonge Street, complete with on-air reminiscences of CHUM’s glory days, a website retrospective, and passionate CHUM fans lining the sidewalks to say farewell to one of Canada’s signature radio stations. “Team” failed, and rather spectacularly at that, and even the watered-down, mostly voicetracked version of 1050 CHUM that returned to the Toronto airwaves in 2002 had its devoted admirers, at least judging by the crowds that lined up around the block on a rainy day last October to get one last look at the 1331 Yonge Street studios before they’re sold to be demolished for a new condo development. And just like that, half a century of Canadian radio history was gone. The 1050chum.com website, which had become a repository of CHUM’s long legacy, began redirecting to CP24’s site as soon as the announcement was made. There were no on-air farewells to be heard on 1050, since the station’s evening and overnight programming had already been tracked. Even the final moments were graceless: while “Please Release Me,” the last full song heard just before 5 AM Thursday, might have been picked as a nod to the end (again) of CHUM, there was still a minute or so left to kill, so listeners heard the beginning of “Black Magic Woman” before an unceremonious dump into CP24’s audio, complete with a steady diet of “as you can see” and “as these pictures show,” and little regard for anyone trying to follow along on the radio. For two decades on powerful WBZ (1030 Boston), and for many years before that on WMEX (1510 Boston) and afterward on WHDH (850 Boston), Glick’s informal style and offbeat sense of humor defined a new kind of talk radio, inspired a generation of radio people and amused fans all over the “38 states and half of Canada” served by WBZ’s 50 kW signal. (Indeed, for some years when this column was young, the single most commonly-asked question we received was, “what ever happened to Larry Glick?”) Sadly, there’s now a final answer to that question: Glick went in for open-heart surgery near his Boca Raton, Florida home last Thursday, and after 10 hours on the operating table, complications arose and doctors were unable to revive him. Glick was 87. A native of Roxbury, Glick left Boston to serve in the U.S. Army during World War II. Returning, he attended Emerson College, worked briefly at WLNH in Laconia, N.H., then spent some time on a kibbutz in Israel. When he returned stateside in the early fifties, he went to Florida, where he owned WZOK-FM (96.9) in Jacksonville for a few years before moving to Miami’s WINZ, where his life in talk radio began. It was WMEX that brought Glick back home to Boston in 1964, where he joined an all-star staff that included Jerry Williams, though the two wouldn’t work together long. Williams left in 1965, and Glick followed in 1968, moving his nighttime talk show from WMEX’s weak 5 kW signal to WBZ’s clear channel. At WBZ, of course, Glick found his biggest success. Leaving the heavy issues-oriented talk to the daytime hours (a lesson he learned early on at WINZ), he spent the hours from midnight to 5 AM (occasionally being moved to an earlier evening shift) having fun with night owls, early risers and probably every cab driver in the Northeast, dispensing “Glick University” T-shirts, trading quips with newsman Streeter Stuart (often parodied on the other side of the glass by newshound “Streeter Glick”) and longtime producer Kenny “Muck” Meyer, and “shooting off” callers with a barrage of sound effects. Glick’s long run at WBZ came to a close in 1987, evidently with some acrimony, judging by his reaction when your editor reached him a few years later in hopes that he might appear on a reunion show. (Fortunately, whatever breach existed was repaired later on by Glick’s spiritual successor at WBZ, Steve Leveille; after Leveille inherited the overnight hours from Bob Raleigh, Glick made several well-received appearances as a guest on the Leveille broadcast.) From 1988 until 1992, Glick’s Boston career wrapped up at WHDH, but his show didn’t fit as well with that station’s issue-oriented talk, and the station’s attempt to move him into a daytime slot was simply the wrong spot. Glick retired from radio, turning his attention to a new career as a hypnotist and eventually moving south to Florida. This week’s top story comes from RHODE ISLAND, but it’s really about MASSACHUSETTS, too, as one Boston broadcaster exits the Ocean State and another prepares to enter it. Steve Mindich’s Phoenix Media/Communications Group is selling WWRX (103.7 Westerly) to Entercom for a reported $14.5 million. Mindich bought the station in 2000 when Clear Channel had to spin it off; he flipped it to modern rock as “FNX,” running it first as part of the “FNX Network” based at WFNX (101.7 Lynn MA) and later breaking off for mostly local programming. That local programming came to an end last Monday, with WWRX returning to a temporary WFNX simulcast in preparation for Entercom’s May 1 takeover. When Entercom gets the big signal (it covers Rhode Island and serves big chunks of eastern Connecticut and southeastern Massachusetts), it’ll flip 103.7 to a simulcast of sports WEEI (850 Boston), extending that station’s programming to a market that can’t hear it very well after dark – and bringing some pretty big competition to Citadel’s WSKO (790 Providence)/WSKO-FM (99.7 Wakefield-Peace Dale, which broadcasts from the very same tower as WWRX!) What the new WEEI-FM won’t bring with it – at least not right away – is the 2004 World Champion (we can, and will, dream, especially with Opening Day just days away) Boston Red Sox, whose contract keeps them on WSKO sister station WPRO (630 Providence) through the end of the 2004 season. Entercom says it plans to move the Sox to 103.7 in 2005, the last year of its current contract with the team. There’s a new signal on the air in western PENNSYLVANIA. Clarke Ingram, scanning the dial from his base in NERW’s Pittsburgh bureau, reports that WFJY (660 Wilkinsburg) signed on Friday afternoon, running talk programming from the National Radio Network and ID’ing with sister station WVFC (1530 McConnellsburg). This is the new facility for the silent 1470 Portage, moving some 75 miles from the Johnstown area to the WURP (1550 Braddock) towers just east of Pittsburgh – and now that it’s on the air, we suspect Alex Langer’s next move will be to build out the CP that moves WVFC east to the Philadelphia market, on 1180 in King of Prussia from the WWDB (860) site. The big-band sounds that disappeared from WQEW (1560) just before New Year’s are back on the air in NEW YORK, at least in the parts of the market that can hear WNJR (1430) from Newark, New Jersey. Arthur Liu began stunting his new format on “Sunny 1430” Monday morning, with a full roster of DJs (including latest hire Julius LaRosa) to start March 29. The station’s initial 5AM-7PM schedule will go to 24 hours as additional leased-time contracts at WNJR expire. Liu has bought the remains of the old WNEW record library, which ended up at WJUX (“Jukebox Radio”) before the Bergen County (er, Monticello NY) station went to an oldies format. He’s also reported to be negotiating with CBS for the WNEW calls, but the price is said to be in the high six figures. Just a bit to the north, WRKL (910 New City) returned to the Rockland County airwaves this week, with a simulcast of the Polish-language programs from sister PolNet station WNVR (1030 Vernon Hills IL), now claiming a “New York-New Jersey-Connecticut” relay on 910. We were remiss last week in overlooking Rockland County’s other commercial AM, little WLIR (1300 Spring Valley), ex-WGRC, WRRC, etc. The station is playing adult standards with little, if any, local content. We’ve been reading about 1300’s history, as well as more than 150 other New York-area AM stations, in an incredible book called The Airwaves of New York, by Bill Jaker, Frank Sulek, and Peter Kanze (McFarland, 1998). We thought we knew a lot about New York radio history, but these guys have done their homework — there are stations in here we never even heard of before now! In the Albany area, Sinclair is officially dropping its plans to buy WMHQ (Channel 45) from public station WMHT TV/FM. No word yet on what the WMHT folks will do now; they’d hoped to use proceeds from Channel 45 to fund DTV conversion and a new studio facility. NERW wonders whether the financially-strapped Sinclair will go forward with its plan to buy Buffalo’s secondary public station, WNEQ (Channel 23); those plans are apparently in some doubt now as well. The new modern AC station on 104.9 in Altamont, ex-WSRD Johnstown, is applying for the “WAAP” calls as “the Point.” Its new PD and morning talent is Pat Ryan, who comes across the hall from nights at WYJB (95.5). And over at WABY/WKLI-WKBE, Paige Laimers succeeds former co-owner Bill Hunt as general manager. The 99.7 formerly allocated to Old Forge has been granted a change of city of license to Newport Village, which in reality will mean 1400 watts from up in the hills east of Utica. Calls on this yet-unbuilt rimshotter are “WBGK” for now. Up in MAINE, the days of “Mount Rialto Radio” are numbered. WCDQ (92.1 Sanford) and sister AM WSME (1220 Sanford) are being sold to Boston’s Steve Mindich and Phoenix Media Group. When the sale closes, WCDQ’s eclectic rock format will give way to a relay of Mindich modern rocker WFNX (101.7 Lynn), with the new calls “WPHX” being requested. (Those with particularly long memories will recall that Mindich wanted to use that callsign in the early ’90s when he planned to purchase Channel 46 in Norwell, then WHRC-TV and now WPXB). WSME will apparently stay with its syndicated talk format.